On a snowy Sunday afternoon, several of the Twin Cities Theater Bloggers gathered in an old firehouse in Minneapolis to witness the rolling world premiere of a new play called Mermaid Hour, which means that the premiere is happening in several theaters around the country. 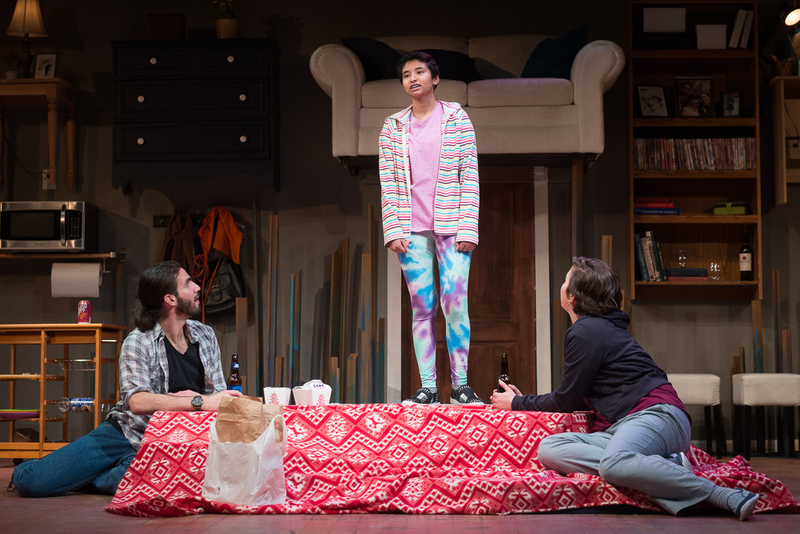 In this story of a 12-year-old transgender girl, her parents, and her friends, playwright David Valdes Greenwood set out to "write a real portrait of a family life, not just an 'issue' play with a message of 'do this' or 'do that.'" From where I was sitting, he succeeded. But what makes Mixed Blood Theatre's production of Mermaid Hour special is that it's the only one of the world premieres to feature music; the Mixed Blood team worked with the playwright to turn his play into a musical. As a musical theater nerd who thinks every play is better with music, I couldn't be happier with this turn of events. Mermaid Hour: Remixed is not only a real and relatable family story that features transgender characters, too often under- or mis-represented onstage, but it's also done in song! The nice thing about this story is that it picks up after 12-year-old Vi has realized that she's a girl, despite being born in a boy's body, after she's communicated that to her parents (at the age of 6), and after they've accepted it. So there's no struggle for Vi, or for her parents in terms of knowing who their daughter is. Instead, the story is more of a typical coming-of-age story, with all of the drama of being a pre-teen (costume parties, boys, searching for idols on the internet, running away from home). Vi's parents, Pilar and Bird, are trying to do their best for Vi and their own relationship, but like all parents, sometimes they get it wrong. Vi has a crush on her best friend Jacob, even though she knows he's gay and he reminds her he likes boys, and she's a girl. Pilar and Bird have both an ally and an obstacle in Jacob's mother Mika, who understands what it's like to have a child who doesn't conform to social norms, but is a bit more conservative when it comes to Jacob and Vi's relationship. Like most kids, but maybe more than most kids, Vi feels like no one understands her, so she does what kids do these days - she goes to the internet. She's found a wonderful role model in a youtube merperson, who tells her she's beautiful just as she is. She eventually meets the gender queer Crux in person, a real life mentor and resource for Vi and her family as they navigate the choices of impending puberty. At the end of the musical, you get the feeling that this family is going to be OK, if they continue being open, honest, and supportive of each other. The bloggers' first question in our post-show discussion with some of the cast and creative team was about the unique musical aspect of the show. Upon seeing a reading of the play, Artistic Director Jack Reuler had the idea that they could elevate the story and make it more universal with music. He and director Leah Anderson worked with local composer Eric Mayson (whom Leah referred to as "an actual genius," and I can't disagree) and the playwright. Together they decided which dialogue to leave spoken and which to turn into music, with the playwright converting his dialogue into lyrics. The result is a story in which music is so intrinsic to the storytelling that you would never guess used to be a play. Jack thinks that when the rolling world premiere is complete, the musical version is the one that will go out into the world for future productions. This play requires very specific diversity in casting, and if any theater can find a fantastic cast that meets the requirements, it's Mixed Blood, one of the best (if not the best) #TCTheater in terms of diversity in all of its meanings. For the lead character they've discovered a star in teenager Azoralla Arroyo Caballero, so natural as the sweet and strong Vi that it's hard to believe it's their first professional show. As Vi's parents, Thallis Santesteban and Michael Hanna believably convey all of the joys and frustrations of being a parent; it's obvious Pilar and Bird love their daughter as much as they're uncertain about the right thing to do. Meng Xiong is charming as Vi's friend Jacob (with some serious break-dancing moves), Sheena Janson is fantastic as always as Jacob's mother, and Catherine Charles Hammond makes for a radiant merperson and mentor to Vi. The set for this show (designed by Britton Mauk) is super interesting and I'm not sure I've figured out what it's all about yet. 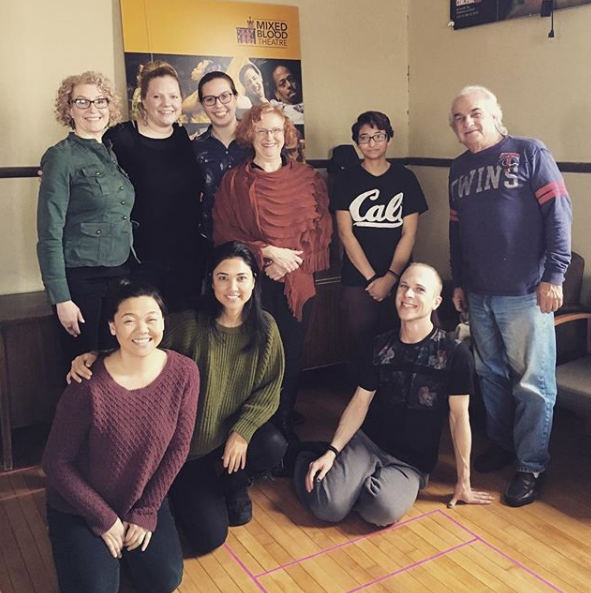 Mixed Blood's black box performance space is set up the same as it has been all season, a three-sided thrust stage. For the family home, all of the furniture is mounted on the back wall, elevated several feet above the floor, with just a small rolling table and a couple of chairs moved out and used in the middle of the space. I don't know if this is simply to represent everything that's in a home while freeing up floor space, or whether it has a deeper meaning, like things are up in the air. Either way it's pretty cool. A couple of scenes take place in small stages out in the audience; I would recommend sitting on the right side of the stage (near the band) to avoid having to crank your neck to look behind you at the scenes Jacob's house. If you get to the theater a little early you can enjoy the awesome three-piece band, led by composer/music director Eric Mayson on keyboard, in a mini-concert before the show. The music continues when the show begins, with songs are cool, interesting, and well-sung (especially by powerhouse voices Sheens and Michael), catchy uptempo numbers and sweet melodies. The dialogue and music smoothly and organically flow into each other, perhaps because of the unique way the musical was written. It's a curious bit of happenstance that Illusion Theater opened The Pink Unicorn on the same weekend that Mixed Blood opened Mermaid Hour: Remixed. Both tell stories of transgender youth and their parents, but in very different ways. One is a one-person 90-minute monologue, the other is an ensemble chamber musical. But both do a wonderful job humanizing people who might seem to be very different from us, showing us the similarities we all have as humans while illuminating their specific experience. If you only have time to see one of them, well.. make more time in your schedule, especially if you know any transgender youth. Both shows are excellent and make for a great pairing. The funny, sweet, relatable, and poignant new original musical Mermaid Hour: Remixed continues through April 29 at Mixed Blood Theatre in the West Bank neighborhood of Minneapolis.